Try patented Flexiphene Surfactant Solutions today and put the power of graphene to work in your formulations. 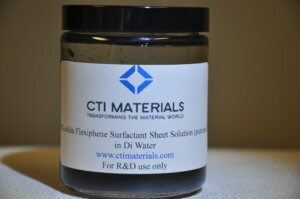 Flexiphene is amphiphilic and compatible with water, solvents, and many other host matrices. To Buy Flexiphene, please contact us with the amount and loading ratio you need. Standard concentration is 2mgs/ml. Flexiphene is transforming the material world! 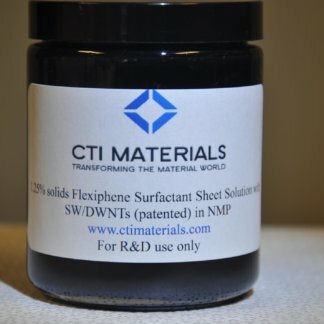 CTI Material’s patented Flexiphene Surfactant Solutions can form colloidal dispersions in many solvents and other matrices. It’s a nanosolution that works! Flexiphene is amphiphilic and can be tuned by adjusting pH or sheet size. Higher pH values results in increased edge charges and increased hydrophilicity of the sheet and works well in aqueous solutions. It’s has hydrophilic edges and is more hydrophobic towards the center of the sheets. Smaller sheets, have a higher edge-to-area ratio and are typically more hydrophilic than larger sheets. The size of hydrophobic nanographene regions on the basal plane of the Flexiphene sheet can be tuned by different degrees of reduction and removal of oxygen functionalities. Zeta potential measurements indicate that the charge density of Flexiphene sheets typically decreases with lower pH values, increased sheet sizes, and increased degree of reduction and works well with many solvents. Flexiphene doesn’t interfere with mechanical or conductive properties like traditional surfactants do. Flexiphene works with non functionalized materials so one material is pristine and not damaged while a functionalized material provides for colloidal dispersion. 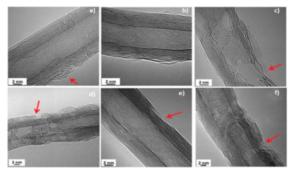 Flexiphene can be chemically or thermally reduced leaving a mechanically strong, conductive, stabilizing molecule preventing (it can form π−π bonds) re-agglomeration and forming cnt intercalated graphene stacks. Flexiphene gives your the flexibility to formulate with all carbon nanostructures. Don’t spend hours performing multiple solvent washes and gas treatments trying to remove typical surfactant residues. Simply reduce flexiphene and find the properties you’re looking for. Flexiphene is a nano solution that works! We sell Flexiphene surfactant solutions tailored for your specific application. To order, please contact us and tell us what matrix you are materials into, the volume, and the loading ratio you require. We can advise you if you are unsure. Please contact us today!